There is the common belief that being a motorcycling journalist is the best job in the world and who am I to disagree? However, it’s not all a bed of roses. No, honestly. If we’re lucky, we have a test bike for five days (more often than not, two or three), in which time we have to get a thorough understanding of the machine and its capabilities and flaws and deliver an eight minute script and a 1000 word essay, often without leaving the confines of the city. In an ideal world, we would be able to go away for five days and dig deep into the soul of the machine. Of course, once you’ve done a few hundred of these jobs, you do get a good sense of what a bike is like within a short space of time and distance but, still, to live with it for a little while would be nice. Thus, when the opportunity comes to actually get out of the city for a while and put some significant miles under our wheels, we jump at the chance. 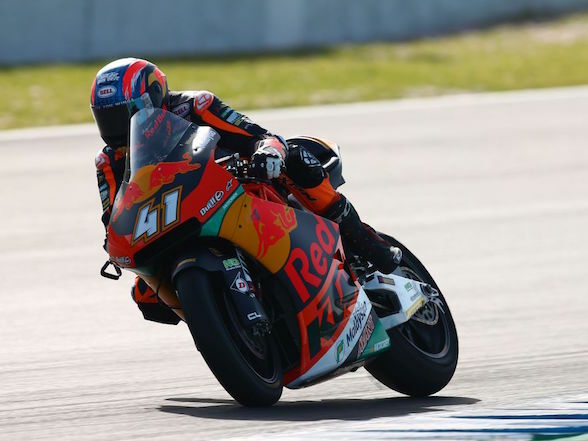 Of course, then comes the problem of deciding which bike to ride; superbikes or naked sports bikes are plentiful and brilliant but not necessarily for long journeys. Even if there is a twisty road at the end of countless highway miles, it is often not enough to counter the pain of getting there in the first place. And therein lies the rub; sports bikes do not any longer hold the monopoly on fun in the twisty bits. It is a rare bike indeed that can’t hold its own scratching around country lanes, no matter its primary purpose. 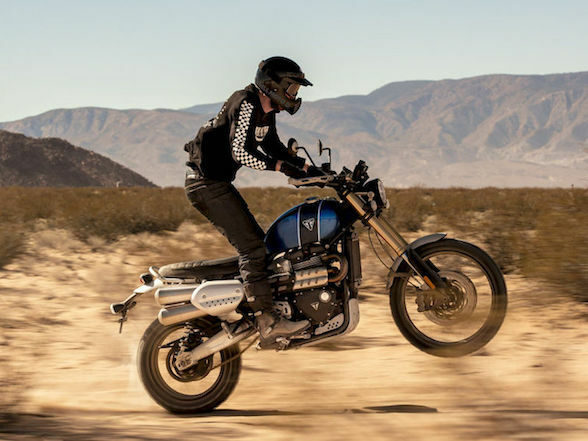 Often the more relaxed dynamics of non-sports bikes can afford more accessible fun while giving away very little in terms of ability; I have seen some adventure bikes being ridden with complete abandon and way faster than they have any right to be able to be ridden. And when the fun comes to an end, they can transform their character to offer a relaxed and comfortable ride home, eating up the miles with ease. If you are in love with motorcycling, which I assume those of you reading this are, then there is no better feeling than swinging your leg over a bike with the prospect of a few hundred kilometres ahead of you; even more so when the skies above are clear and blue, the roads dry and temperatures set only to rise as the day wears on. South Africa might have its problems (tell me any country that doesn’t) but inclement weather really isn’t one of them. 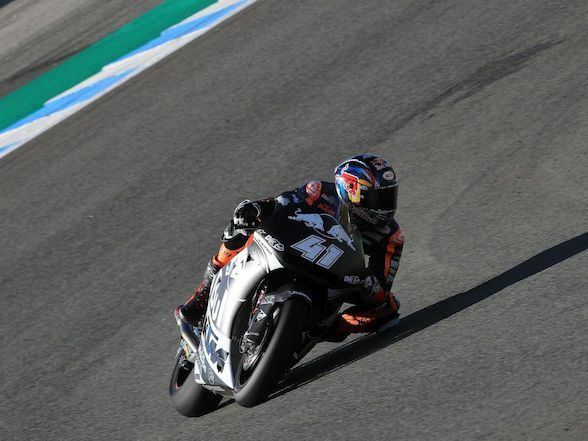 It is, in fact, a riding paradise; I have been to very few countries where one can rely on the weather to the extent we can here and plans can be formed in the confidence that the weather will be perfect. If only the same could be said of the roads. Of course, I’m not suggesting that English roads were only formed by intoxicated ramblers but it describes perfectly how English country roads wind seemingly at random across the countryside, providing a fantastic canvas upon which to paint tyre marks. And it is precisely that lack of ancient infrastructure that can make riding in Gauteng so dispiriting. It could be said that, for motorcyclists, the best things to come out of Johannesburg are any of the main roads that whisk the rider away from Gauteng and into neighbouring, more undulating territories and yes, the escape from the city is something to be endured rather than enjoyed, which makes the choice of motorcycle even more important. 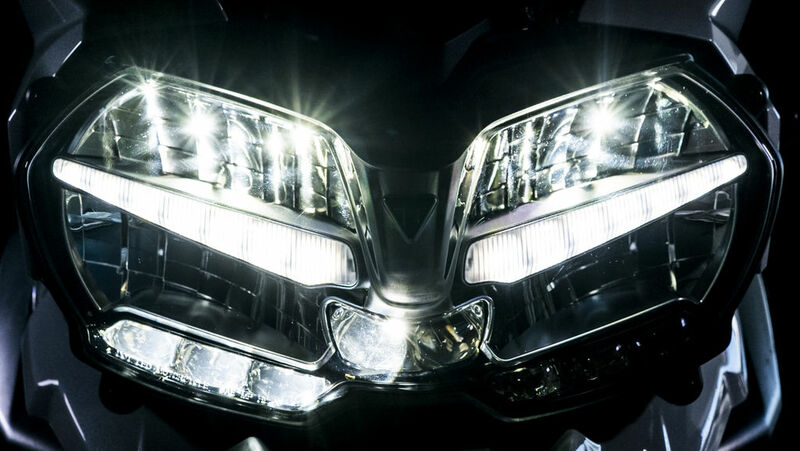 Triumph’s Tiger 1200 has been around for a few years now and has proved successful. 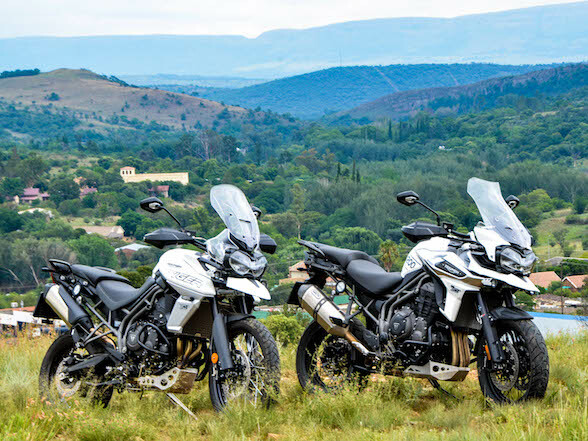 While the majority of the South African adventure community has squabbled over the BMW/KTM issue, leaving Triumph, Suzuki and Yamaha to pick up the crumbs, the rest of the world, with nowhere near the amount of adventure riding possibilities available on their doorsteps – and, possibly, lacking the level of adventurous spirit of South Africans – has seen these bikes in a slightly different role; that of a large, comfortable, capable, all-round machine that will devour miles as easily as a dedicated touring bike but one which can cut it in a variety of different terrains. 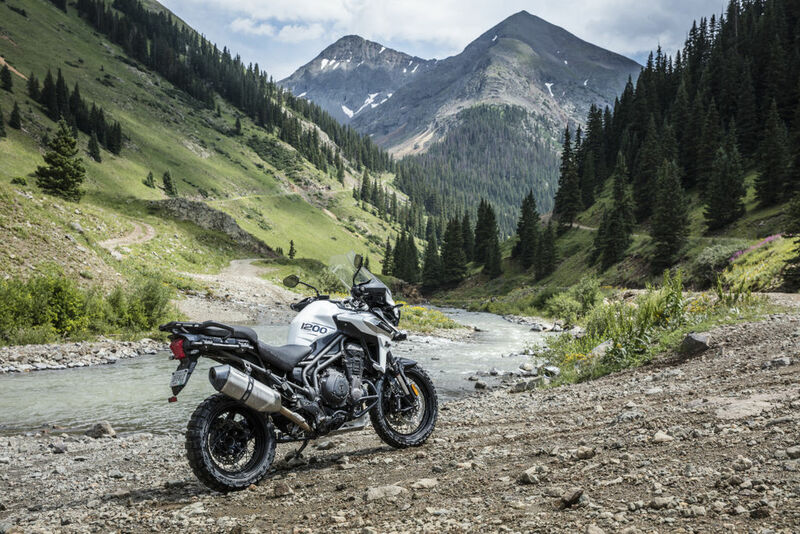 Looked at in that light, the Triumph Tiger 1200 (it has lost the ‘Explorer’ name for 2018) is a genuine contender for best all-round adventure bike. 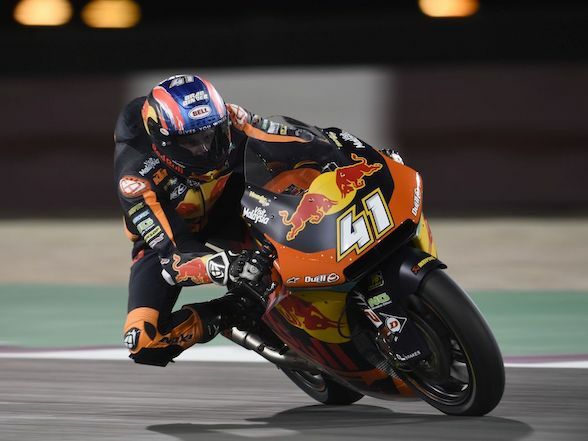 As with all the 1200cc adventure bikes, it is a brave and skilled rider who can expect to get the best out of these behemoths on anything but a smooth gravel road but, then again, the ability is there should you need it. 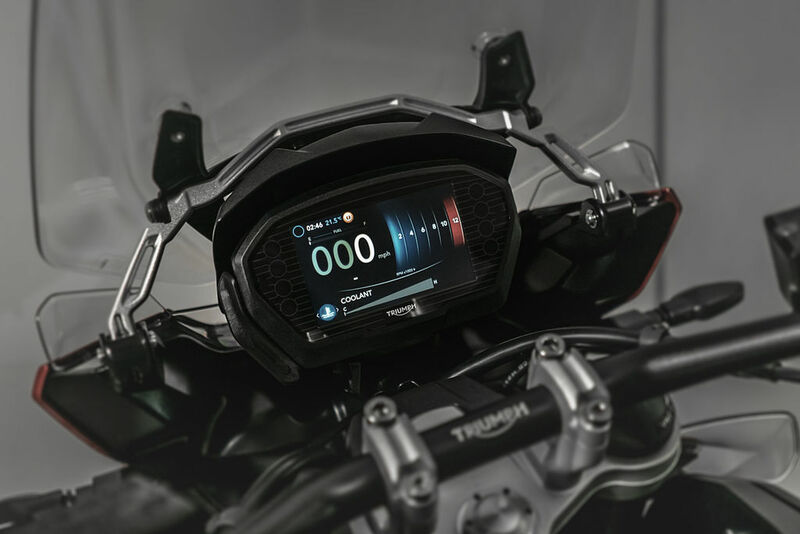 Modern electronics have done as much as they can to make these bikes manageable off-road, although the only things they can’t do are possibly the most important; pick the bike up when you have dropped it for the umpteenth time or pay for the cosmetic damages. That latter point is pertinent. Bikes have not only become ever more sophisticated, complicated, capable, comfortable and safe but they have also, at the same time, become far more aesthetic, if one can put it that way. Look at a BMW R80G/S from the early 1980’s and whilst it may represent the state of the art from that period, it is also, because of that, far more practically rugged. Of course, the same observation could be levelled at the 4X4 SUV. Look at the first Range Rover from 1970 and, even though it was touted as a luxury alternative to the Land Rover, it is still utterly utilitarian compared to today’s models. What is true in both the modern car and bike’s case is that sometimes you have to wonder what the driving force was behind the design; aesthetics or practicality and ruggedness? But I digress. What point was I making? 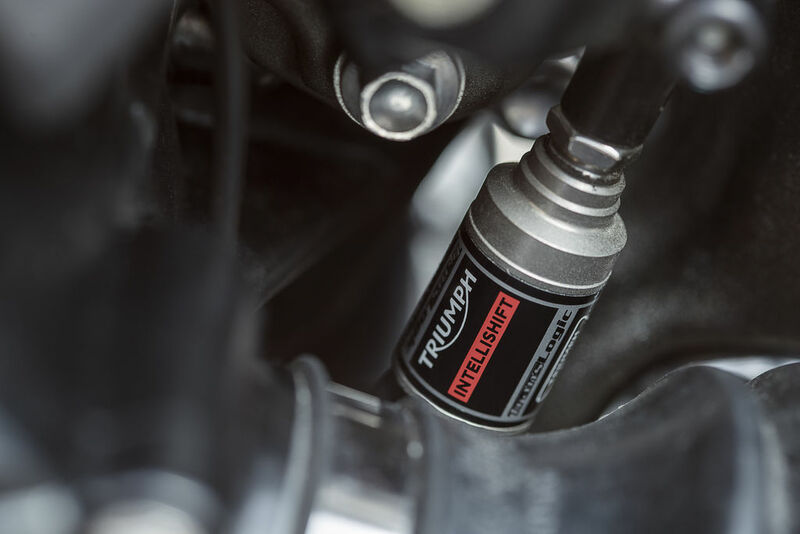 Oh, yes, the Triumph may be an adventure bike and to play in that category it has to have a definite level of ability off-road, which it undoubtedly has but, to many, it is road performance that is of primary importance. And, by happy coincidence, this is where the Triumph excels. Firstly, the engine; I would make the possibly controversial observation that a truly effective adventure bike engine has two cylinders; the torque characteristics of that configuration, whether boxer, Vee or parallel, are more suited to plugging through or over terrain than a configuration that requires higher revving. 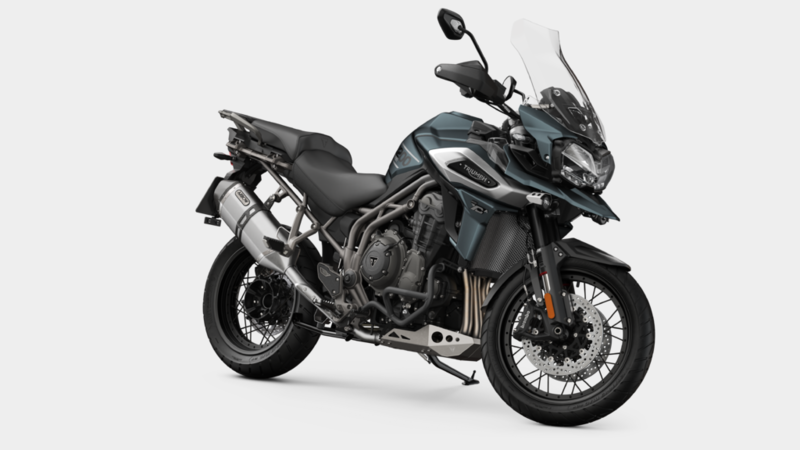 Call me out on this one, if you wish but I will use the dearth of any four-cylinder adventure bikes and only one three-cylinder to make my point. 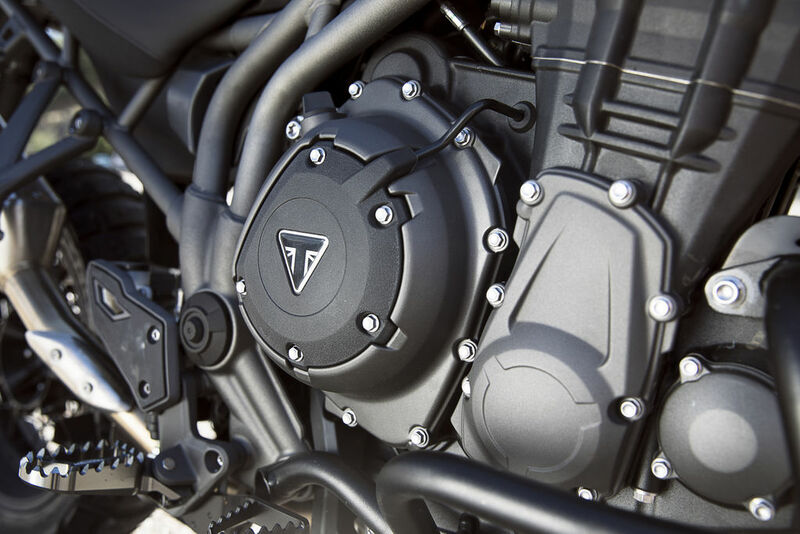 Triumph has long been known for their triple-cylinder engines and thank goodness for that. There are many distinctive exhaust notes in motorcycling but, for me at least, the howl of a triple is right up there near the very top. And the engines that produce that sound are, in a short word, wonderful. Thus the 1215cc, 134bhp, 123Nm version that is housed in the Tiger 1200 fills me with a joy that is reserved for only a few power units. It will not produce fireworks, nor will it rip your arms out of their sockets, but what it will do is provide linear acceleration from very low revs right up to its screaming red-line and, if that sounds a little underwhelming, that is because it does what it does with so little fuss, yet manages to do it with so much character that its ultimate performance, of which there is plenty, isn’t immediately apparent. It is, in fact, everything you want an engine to be. The chassis is equipped with the very latest in WP suspension thinking and, on some models, this is electronically controlled. I suspect that many of us think so little about the suspension that to be a suspension designer must be quite frustrating but that fact of the matter is that modern suspension works so well that we really tend not to give it a second thought which is probably a good thing as, unless you know an awful lot about it, it is very possible to completely screw up the settings on adjustable suspension to the point where it becomes dangerous. Hence, electronic (and instant) adjustability is a bonus. Comfort is the Triumph’s strong suit; broad and well-proportioned seats, easy reach to wide ‘bars and good wind protection via an electrically adjustable screen. Heated grips and rider and pillion seats complete the picture. 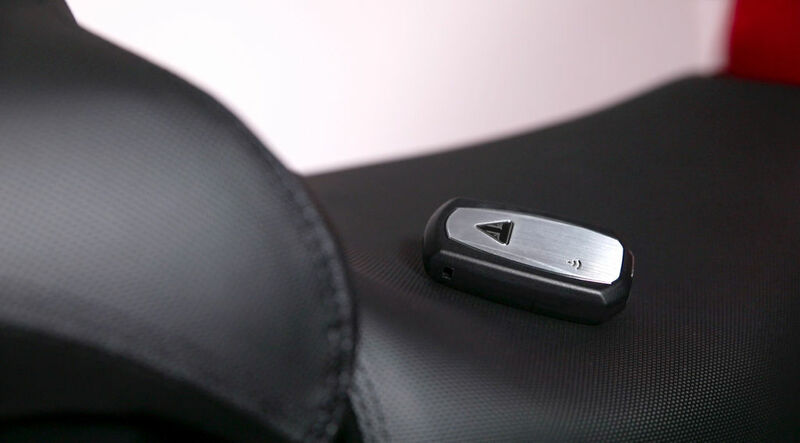 Cruise control aids long-distance comfort immeasurably and back-lit switchgear helps at night. It’s a classy place to sit for hours on end and the quality of fit and finish is apparent. The fuel tank holds 20 litres, which is about par for the course for these bikes and gives decent enough range. 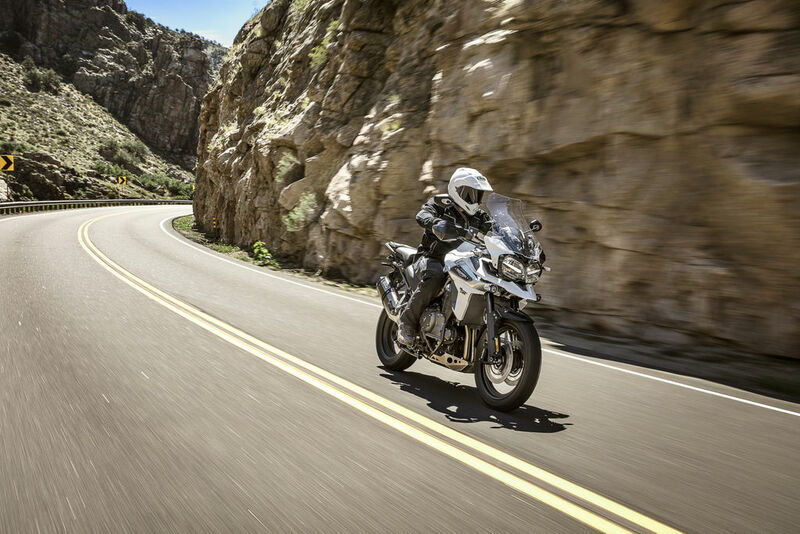 Only the KTM 1290 Super Adventure and the BMW R1200GS Adventure (30 litres both) offer greater range in this class, with accompanying greater weight. The long, straight N14 from Johannesburg to the Mozambique border, via Nelspruit, may be boring but the Triumph despatches it with ease. Taking the turn-off for Belfast turns your wheels in the direction of Dullstroom, Lydenburg and the supremely entertaining rise and fall of the Long Tom Pass towards Sabie. 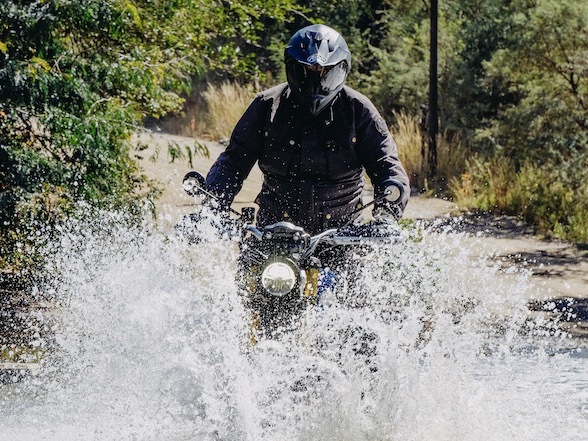 This north western corner of South Africa provides some of its best riding roads, although the lack of maintenance is rapidly reducing some stretches to pot-holed nightmares. 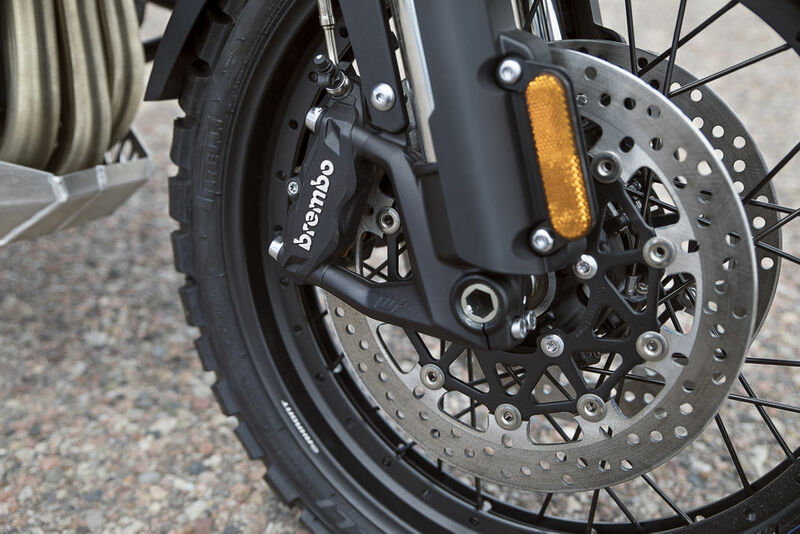 Of course, this does rather play into the hands of adventure bikes with their long-travel suspension, although contact with a pot hole can dent a wheel rim at best, or throw the rider off at worst. It really is the most beautiful part of the world through which to ride. Anyone with a passing interest in the history of what used to be called the Transvaal cannot fail to be impressed with the labours of the wagon trains taking supplies to the Johannesburg gold fields through the region, as mountainous as it is. (In fact, gold was mined here – in Barberton – a couple of years before the huge reefs of the Witwatersrand were discovered.) The state of the roads notwithstanding, the riding is spectacular with precisely the sort of winding, meandering roads that Gauteng is so sorely lacking. And the Triumph was the best companion to have. I’ve always preferred the riding position of adventure bikes over sports bikes (although naked sports bikes are a great compromise) and, fast or slow, the overall dynamics of the Triumph were very, very good. 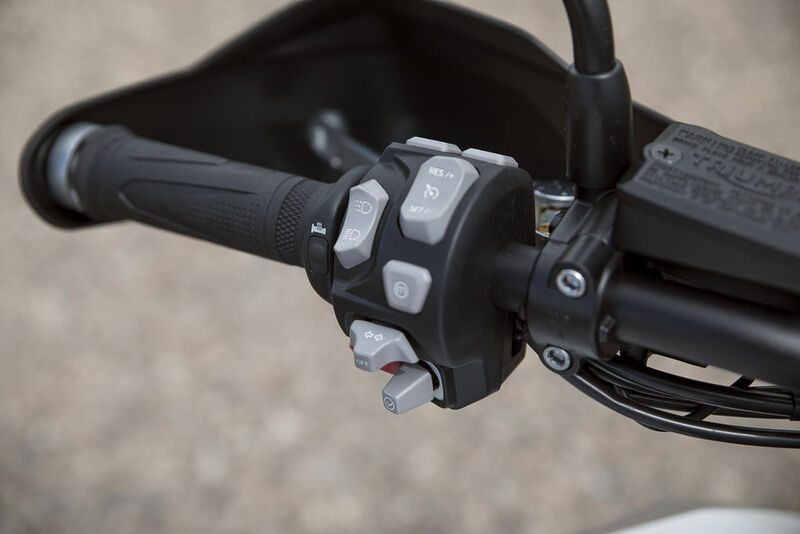 The beauty of the electronic suspension adjustment is that you can change the damper settings on the fly. So, if the surface gets particularly bumpy or you simply want to slow down and take things really easy, you can soften up the suspension to suit. Feel the need to push on a bit and you can firm everything up a bit. All very clever and maybe a bit gimmicky – I mean, didn’t we all have great rides before electronic suspension? But that is just the Luddite in me coming out; why not have it if technology has made it available? A few days and about 1000kms later and not only was I home but I had a good idea of what the Tiger 1200 was all about. No, I had done absolutely no off-road riding but I’d had an adventure and isn’t that what riding a motorbike is all about? 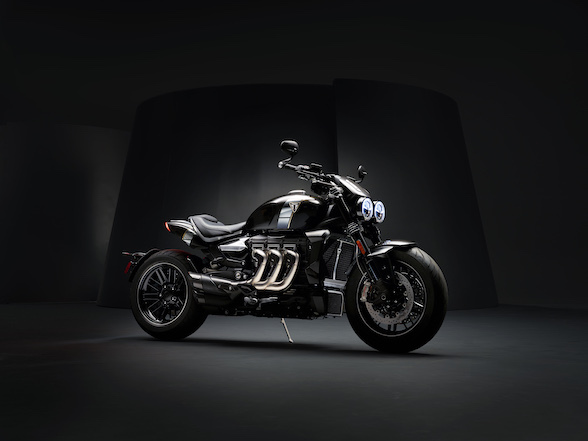 Next Post What does BMW's self riding motorcycle mean to us?